Sometimes the winds of change are a gentle breeze, whispering ideas, and softly coaxing us towards something new. Other times they're a full blown tornado, sweeping us instantly into a new season of life. A few months ago I felt the winds blowing, and somehow without me even noticing, I got swept away. In February of this year I went through a molar pregnancy (you can read about it here). My life went from planning for a new baby to being forced back into my old routine. I was taking online nutrition courses that I had been trying to work through for the past couple of years. If I'm being 100% honest, I was forcing myself to finish every assignment. Whenever I thought about working on this course, a feeling of dread swept over me and I just didn't want to do it. I love nutrition, but the school wasn't a right fit for me. The course content was contradictory, and there wasn't a lot of support. I also felt my general passion for the subjects dwindling. Part of me felt like a huge failure when I made the decision to withdraw. I didn't want people to think poorly of me, because it was one more thing I couldn't finish. I went to school for journalism after high school, and didn't finish that either. I loved journalism, and clearly love writing- but 19 year old Dedreanna made some poor choices and didn't finish what she started. Hindsight is 20/20 right? After the molar pregnancy happened, I began blogging again. I joined several online blogging groups, subscribed to several free courses, and completely immersed myself into the blogging world. I have always blogged for fun, but this felt different, and I really wanted to make something out of this. I'll write another post about how I've built up my followers and gotten collaborations another time, but it's all happening really fast and is so exciting. I've already made so many new blogger friends and it's a whole world I didn't know existed. It feels like I'm finally home. The moment I decided I 100% wanted to withdraw from my nutrition course, I felt an overwhelming sense of freedom and relief. It felt like a huge weight had been lifted from my shoulders and I was free and happy again. The winds of change blew me right back to writing, and I know this is where I'm meant to be. We all know this feeling, but we rarely do anything about it. Do you feel stuck in a job or a bad relationship? Are you tired of living in the same town you've lived in forever? If you feel stuck, chances are you're in need of change. Try making a list of ways you could be happier and set goals to achieve them. Do you spend your time daydreaming about a different life? Are your Pinterest boards filled with pins of your ideal school, house, career etc? Are those pins dreams or are they actual plans. Remember that a dream can turn into a plan by adding goals. If you're constantly dreaming of what could be, you might be ready for a change in your life. Do you believe that other people have it better than you? Are you envious of what others have but feel like you could never have the same things? Remember that the grass is greenest where you water it. You CAN achieve everything you want in life. 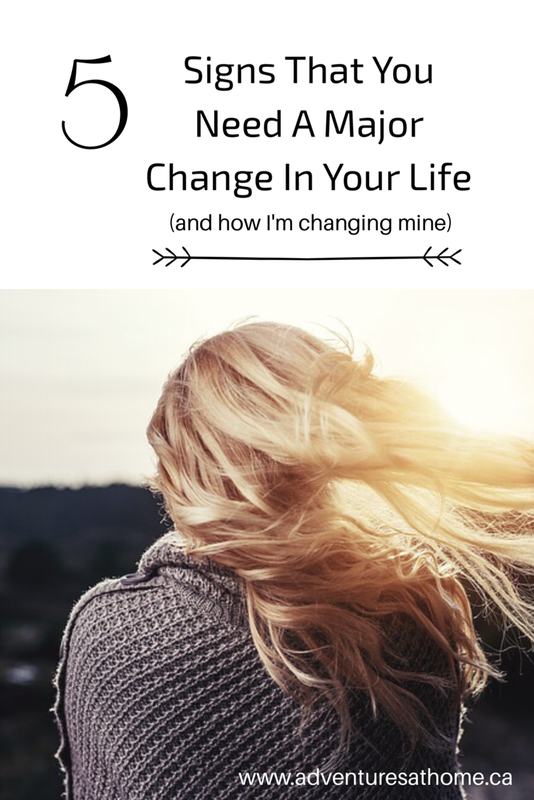 I hate change, and it usually terrifies me, but being afraid of change is exactly how you get stuck in ruts. Sometimes we just have to throw caution to the wind and go for what we want. When I decided to withdraw from my online courses, I was afraid of what my husband would say, afraid of what my parents and friends would say- but guess what? Everyone has been really supportive. I haven't felt this excited and optimistic about something in a long time. One reason we often fear change is because we are afraid of failure. Fear of failure is one of the biggest reasons some people never go for their dreams. If you're afraid of change, maybe its exactly what you need right now. This is the biggest and most important reason for me. If you aren't happy with your life you might not know how to fix it, and that can be really frustrating. I'm here to tell you that happiness is out there. For me, it took something tragic like my molar pregnancy to push me in the right direction. I wish I would have allowed myself to recognize my own unhappiness before that happened. If I would have been honest with myself a long time ago, I may have thrown myself into the blogging world a lot sooner, and I would be much farther ahead in the game by now. I want you to really ask yourself "Am I happy?" Like I suggested in point number one, if the answer is no, make a list of everything that you can change in your life to be happier. The list has to be within reason. I'm sure most of us would be happier if we won the lottery, but the list you make should be actual things in your own life that could be changed or improved. Try to set goals based on your list, and you'll soon realize how attainable your dreams actually are. Comment below and tell me if you've been moved by the winds of change. Where did they take you? Do you feel stuck now and crave change? Let me know! I think that we reinvent ourselves many times over a lifetime and in that we can truly connect with who we are meant to be. I totally agree about being afraid of change. I don't like change, but I can't let that stop me from being happy! I'm in a moment of my life right now where everything inside of me is screaming at me for a change. I think I need to start listening! I think "you aren't happy" is the most important one. If you're not happy, something needs to change. Good for you for pursuing your passing with blogging! Learning how to live simple and be content has been my motto for the past few years. https://mommyisexhausted.com/2017/05/15/blogger-recognition-award/ Recognized your blog in a recent post! :) Love reading!